Filters - Rintoul's Leisurescapes - Above Ground, Inground Pool and Landscape ideas for Owen Sound, Port Elgin and surrounding areas. 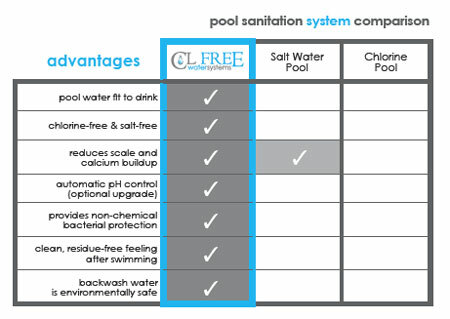 Significantly reduce your dependency on chlorine, salt or bromine!! Systems are available for In-ground pools, aboveground pools, and Hot Tubs. To keep your pool looking appealing and healthy it is important to have a good working filter. Combined with the proper maintenance of chemicals it keeps your pool algae free and safe for activity. There are three popular methods of filtration – Sand, Cartridge, and Diatomaceous Earth (D.E). Cartridge filters have a greater surface area than sand allowing for fewer clogs and easier maintenance. Cartridge filters are designed to run at lower pressure than sand which puts less backpressure on the pump, providing more flow and turnover. Cartridge filters should be cleaned once or twice a season by simply hosing them off. Cartridge element filters trap debris as small as 10 to 15 microns. Diatomaceous earth is mined and is the fossilized exoskeletons of tiny diatoms. They are used to coat "grids" in the filter housing and act as tiny sieves allowing for the removal of debris as small as 5 microns. Once the pressure rises, the filter is backwashed just like a sand filter and then "recharged" with more DE powder. DE filters trap debris as small as 2– 5 microns. At Rintoul’s in Owen Sound , we offer purified drinking water. You can bring in your water jugs for a re-fill, or purchase new ones from us. We offer a “pay-as-you-go” option, or you can buy a water plan and save! Come in today and see the difference that reverse osmosis water makes in hydrating your body!